Home Attire Dress For Success Return to Previous Page. A neat, clean and traditional appearance will give you a competitive edge in the equitation/hunter ring. In fact, it is the tradition of the competition arena that riders be correctly dressed. Halo Horses can advise you to help you make the right choices while assembling your show outfit. Hunt seat equitation riders should wear conservative jackets in season, breeches or jodhpurs and black tall or paddock boots. Conservative colored protective headgear with no additional adornments. Choose a dark colored hunt coat. Although colors are not specified in the USEF rules, dark blue and black are the most popular choices currently. Hunter green is also becoming a trend amongst equitation riders. Be sure that your coat fits well to help you present a neat appearance. Under your coat, wear a button-down show shirt that has either a wrap neck or a collar and choker and again make sure shirt fits correctly. White is the classic color choice for equitation. 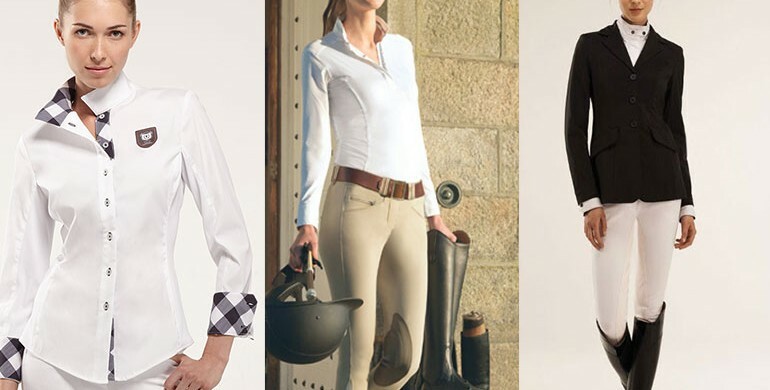 Wear beige, green-beige or tan colored breeches, either side-zip or front-zip in style. Various styles of breeches are popular with equitation riders. Very young children may wish to wear light-colored jodhpurs (11 years old or younger.) A belt should always be worn with breeches; it should be conservative in style. Choose tall, black leather field boots or paddock boots with leather chaps unless you’re less than 11 years of age. The most popular choice of footwear for equitation riders is a pair of black tall field boots. Young children (11 or younger) wearing jodhpurs can wear black paddock boots with matching black straps or garters. Conservative colored helmets are mandatory. Helmets should be ASTM (American Society for Testing and Materials)/SEI (Safety Equipment Institute) certified. Black is the wisest choice for equitation/hunter classes; long hair should be completely contained (no fly-aways) in a hairnet (this should match the color of your hair) under your helmet–except for the case of short stirrup (11 or under) classes or very young riders, for which braids with complementary bows are acceptable. Finish your look by choosing a pair of black gloves. To suit riders’ individual preferences, you’ll discover many styles of show gloves in both leather and synthetic fabrics. Consider special design features that may assist you with your riding comfort, such as flexible gussets between the fingers, added textures for grip and ventilation panels to keep your hands cool. Spurs with leather spur straps, if worn, should be clean and shiny and positioned high on the heel with the shank or neck pointed downwards. If a crop is required it should be a black bat about 18 inches with no handle. If you have a question about dressing for equestrian success, then please give Halo Horses a call at 480-748-1669 or email [email protected].